I’ve been time-traveling in my dreams. Reality and fantasy often converge during sleep, but lately I’ve been taking the next step, justifying the inexplicable by accepting time-travel as an acceptable narrative device. Watching “Lost” while living on an island, it hasn’t taken much for my subconscious to make these leaps. Several times over the last week, I’ve awoken with the rare (and in this case phony) intellectual satisfaction of being able to explain my own dreams: time travel. So it was especially creepy this morning when, on the anniversary of last year’s devastating earthquake, I was rudely awakened by another earthquake. This morning I reported the quake “occurred exactly 1 year and 2 hours after The Big One,” but that’s only because I forgot to account for Daylight Savings. Technically it was only 1 year and 1 hour. The sun was in nearly the same place, the kids at school let out nearly the same scream, and I was in nearly the same position on my couch—with one crucial difference: I was laying the other way. Last year, my head lay at the eastern end of the couch. This morning my head was at the western end. If not for this immediately obvious detail, I might have actually believed The Island wanted me to join the Dharma Initiative. But that wasn’t the case. This morning’s jolt, though slightly strong, lasted less than 10 seconds. I recall I yelled, “Get out!” in an Elaine Bennis sort of way, and then, upon checking the time on my cell phone, realized I was 5 minutes late for second period. This experience encapsulates the national mood as I experienced it today. On one hand, I knew many people who expected today to be a national holiday, and after it was decided not to be, still searched for ways to commemorate the occasion. On the other hand, today was business as usual. A few Peace Corps Volunteers had specially calibrated lesson plans because they assumed there would be no school today. 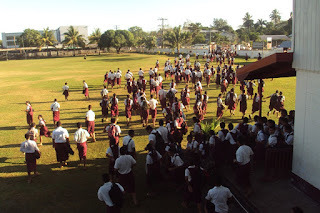 Emails from the Rotaract community invited people to come commemorate the occasion with a moment of silence in front of the government building, while others encouraged people to wear black and white. 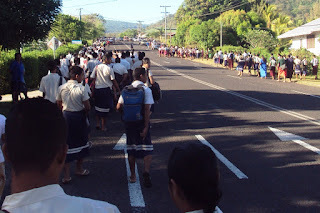 I hear there was some sort of ceremony in Lalomanu this morning, but mostly today functioned like any other Wednesday, which was both strange and a relief at the same time. I attended the launch of (occasional blog commenter) Lani Wendt Young’s book, Pacific Tsunami – Galu Afi on Monday night, which gives a peoples’ history of last year’s earthquake and tsunami. There were speeches and musical tributes and opportunities for emotional release. It proved both cathartic and inspiring. 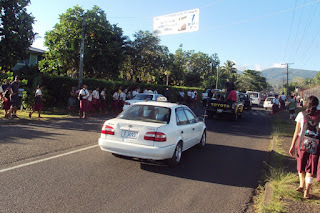 Looking back, the tsunami was literally and figuratively the centerpiece of my Peace Corps experience. 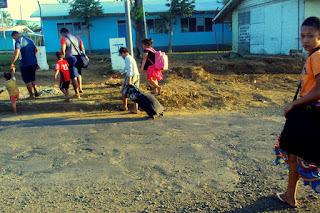 Something changed that day at Samoa’s emotional core, and its effects seem to be everywhere: the cracks in the floor of my computer lab, the jumpiness of my students, the readership of the blog—hell, there’s good evidence Scout was abandoned by her mother as a result of the quake, and thus she came to stay with me. But as easy as it is to see the change, it’s difficult to see life much differently. After all, this morning when I awoke, the sun was in nearly the same place, the kids at school let out nearly the same scream, and I was in nearly the same position on my couch. Sometimes when things change, they kind of stay the same. It’s almost like time travel. I hope you’re well. More pictures from last year below. 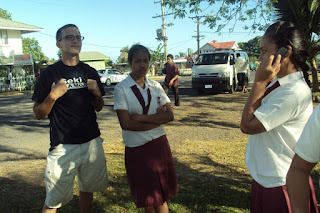 Me standing next to Tui as Mira uses my phone to call her parents after the school was evacuated. Crowds from multiple schools hike to higher elevation. Cars and people evacuating under banners informing drivers of the switch from driving on the right to driving on the left. The switch happened 22 days before the earthquake. 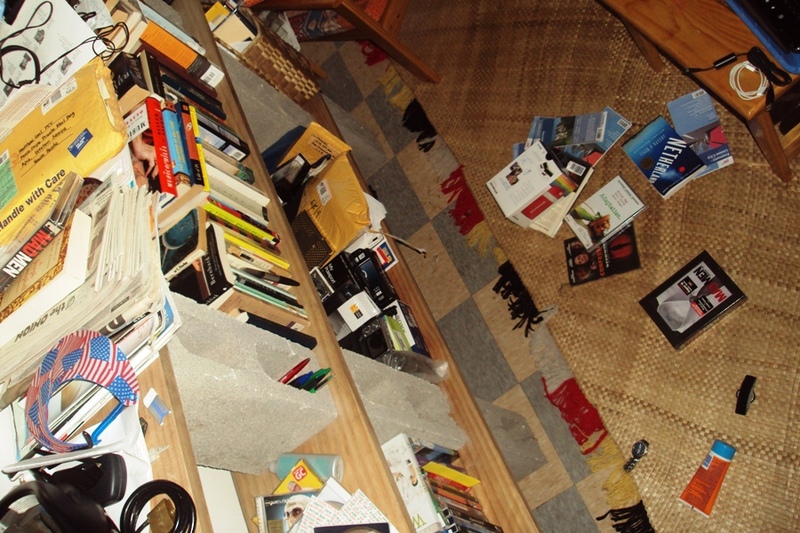 Books in my living room that fell off my shelf during the quake. 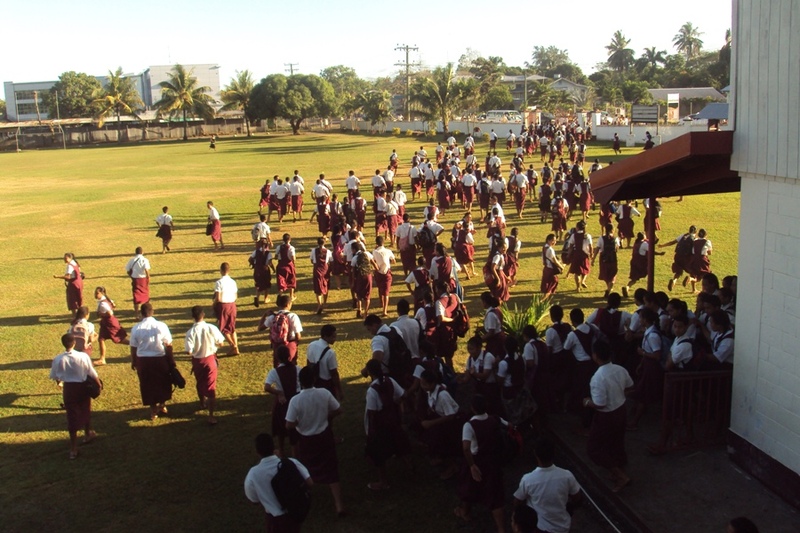 Apia was evacuated again later that evening after sizable aftershocks. This family packed their bags to stay the night up the mountain. HIya Matt - was great to see you at the launch. Thank you again for the stunning pictures - everyone always goes for the photos in a book first! Hope you were okay with the excerpts from your blog that were included in the book. I think i speak for LOTS of people when i say - I wish you werent leaving. Where else will we read such evocative and thought-provoking stuff about life here! ?